Instant Effect - Trade one card from your hand with one card from Ye Olde Book Swap's card area. You may shelve the newly acquired card. Note: Visiting Ye Olde Book Swap has no effect if you have no cards in your hand, or if there are no cards in Ye Olde Book Swap's card area. When placing an assistant at the Auction House, choose one of the four bid spaces. If an assistant is already present, even if one of your own, you must choose a bid space that is a higher number, if able (a bid of four cannot be outbid). Return the lower-bidding assistant to their player - it may be placed again on a subsequent turn this round. 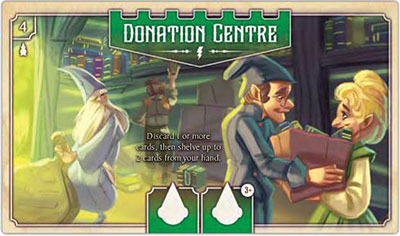 Delayed Effect - Discard a number of cards from your hand equal to your bid space to take the three cards from the Auction House's card area. You may shelve any/all of them. 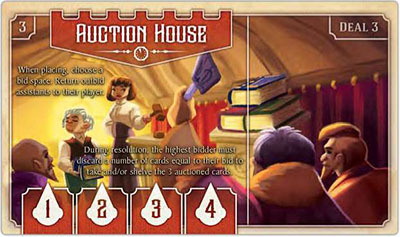 Note: If you are unable to discard the required number of cards, you receive nothing from the Auction House. The Auction House has no effect if there are no cards in the Auction House's card area. Instant Effect -Discard one or more cards from your hand and/or library, then shelve up to two cards from your hand. Instant Effect - First, take one card from the Community Centre's card area. Next, if any cards remain in the card area, give one to any opponent. 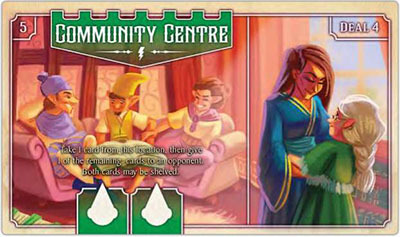 Any cards you acquired from the Community Centre may be shelved. Note: Visiting the Community Centre has no effect if there are no cards in the Community Centre's card area. Instant Effect - Discard any number of cards from your hand (including zero), then draw one more than the number you discarded. You may shelve one of the cards drawn. 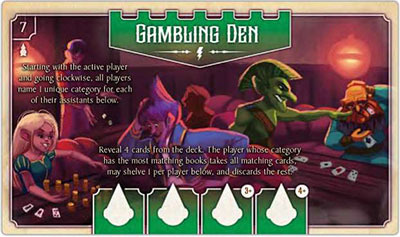 Instant Effect - Starting with the active player and moving clockwise, each player with an assistant at the Gambling Den names a different category. 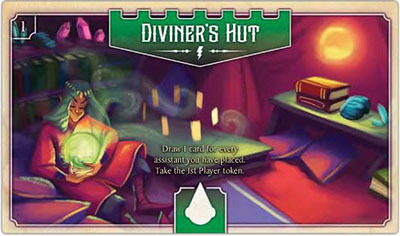 The active player reveals four cards from the deck. 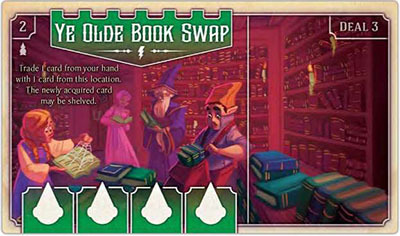 The player whose named category has the most matching books amongst the revealed cards wins and takes all the revealed cards with matching books. Discard any remaining revealed cards. 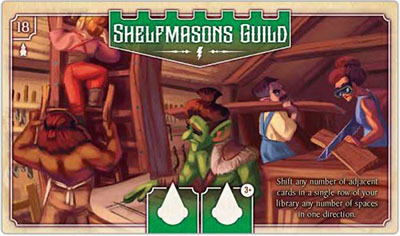 The winner may shelve one of the cards they took for every player with an assistant at the Gambling Den. Note: In the case of a tie between the active player and any other players, the active player wins. If the active player is not part of the tie, the winner is the player closest to the active player, in counter-clockwise order. Example: Anita places an assistant at the Gambling Den, where Scott and Sara already have one assistant each. Anita names Fantastical Fictions, Scott names Spells & Potions, and Sara names Corrupted Codices. Anita reveals 4 cards from the deck. There are 4 Fantastical Fictions, 5 Spells & Potions, and 3 Corrupted Codices. Scott wins, and takes all the revealed cards with Spells & Potions books, discarding the rest. He may shelve 3 of the cards he took, since there are 3 players with assistants at the Gambling Den. If there had been I less Spells & Potions book, Anita (the active player) would have won the tie. Move one of your previously placed assistants from a location's assistant space to one of your library tile's home action spaces and take a home action. Swap one card from your bookshelf with any card in your hand -or- swap one card from your bookshelf with another card from your bookshelf -or- remove one card from your bookshelf, then shelve it again. Instant Effect - Discard any number of cards from your hand and/or bookshelf. 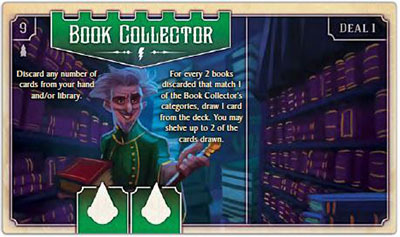 Count the number of category icons on the discarded cards that match a category icon on the card in the Book Collector's card area. Draw cards equal to half that number, rounded down. 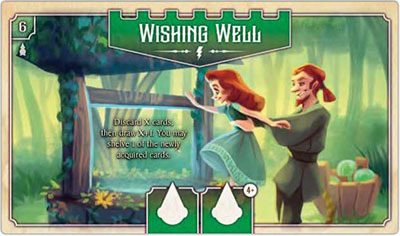 You may shelve up to two of the cards drawn. Instant Effect - Take one card from the Book Seller's card area. You may shelve it. Note: Visiting the Book Seller has no effect if there are no cards in the Book Seller's card area. Delayed Effect - Name a category, then search the discard pile. Take any one card containing a book of the named category. If no cards are present in the discard pile that contain a book of the named category, you receive nothing. If you took a card, you may shelve it. 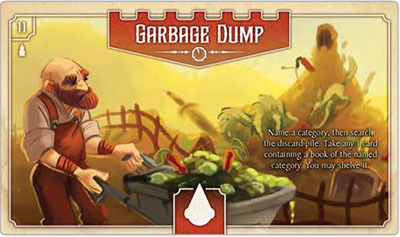 Note: Visiting the Garbage Dump has no effect if there are no cards in the discard pile. 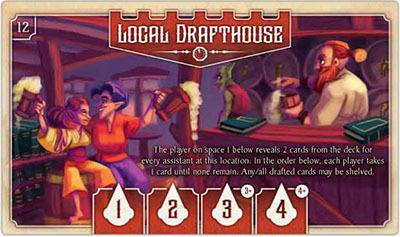 Delayed Effect - The player whose assistant was placed on the first space of the Local Drafthouse reveals two cards from the deck for every assistant present at the Local Drafthouse. 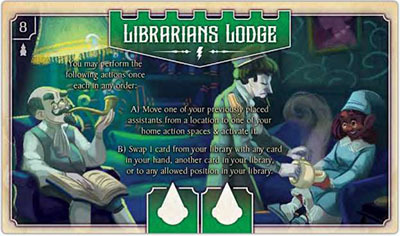 The player whose assistant was placed on the first space takes one of the revealed cards, followed by the player whose assistant was placed on the second space, and so on, repeating the process until all the revealed cards have been taken. Any/all of the cards taken may be shelved. Instant Effect - Name a category, then look at all the face-down cards on the Mystery Shack's card area, without revealing them to your opponents. 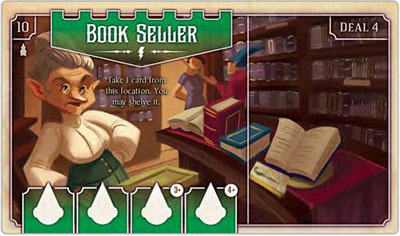 Reveal and take any/all cards containing at least one book matching your named category. Return the remaining cards face down. You may shelve one of the cards newly acquired. 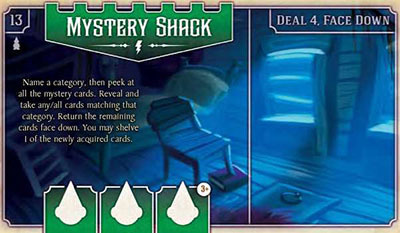 Note: Visiting the Mystery Shack has no effect if there are no cards in the Mystery Shack's card area. Instant Effect - Take one of the cards from the Rummage Sale's card area. Take one additional card if another assistant, including one of your own, is present. All cards taken from the Rummage Sale may be shelved. 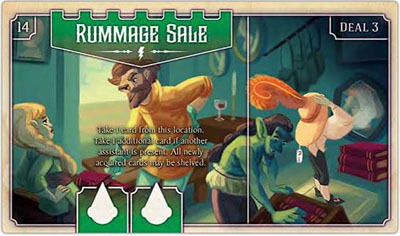 Note: Visiting the Rummage Sale has no effect if there are no cards in the Rummage Sale's card area. 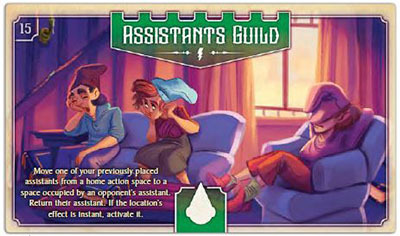 Instant Effect - Move one of your previously placed assistants from one of your library tile's home action spaces to a location's assistant space that is occupied by an opposing assistant. Return the opposing assistant to that opponent - it may be placed again on a subsequent turn this round. If the location's effect is an f Instant Effect, activate it. Note: Visiting the Assistants Guild has no effect if you do not have an assistant on one of your library tile's home action spaces. Instant Effect - First, in turn order, each opponent must discard one card from their hand or library face up to the Tax Collector's card area. Next, you may discard any number of cards from your hand or library to take the same number of cards from the Tax Collector's card area. 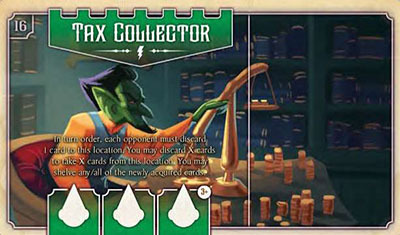 Lastly, you may shelve any/all of the cards taken from the Tax Collector's card area. Instant Effect - Reveal any number of cards from your hand. In turn order, each opponent may take or shelve one of your revealed cards or pass. Repeat the process in the same order until all your revealed cards are gone or all of your opponents have passed. For each of your revealed cards taken or shelved by an opponent, draw two cards from the deck, then shelve any one card from your hand. 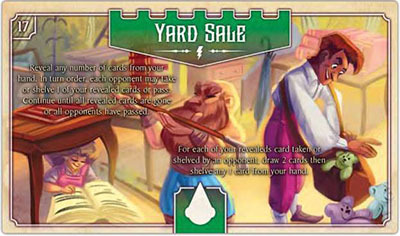 Note: Visiting the Yard Sale has no effect if you have no cards in your hand. 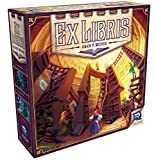 Instant Effect - Shift any number of adjacent cards in a single row of your bookshelf any number of spaces in one direction, ensuring that you do not split your bookshelf into two separate groups at any point in the process.